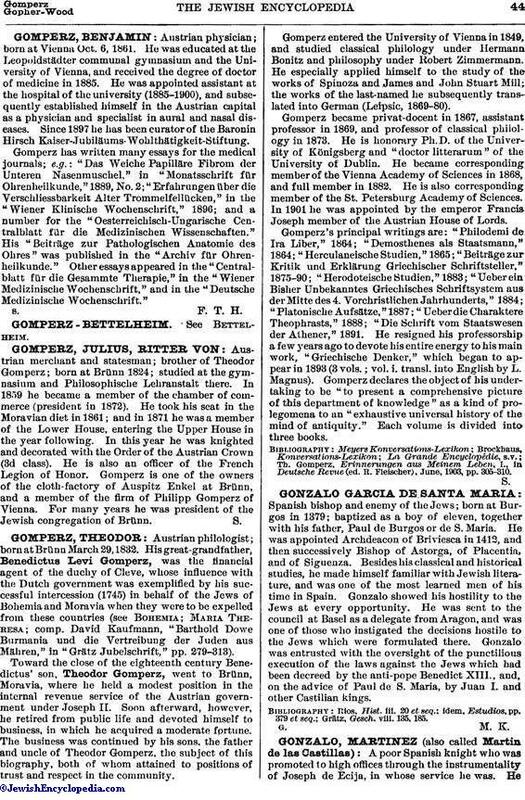 Austrian merchant and statesman; brother of Theodor Gomperz; born at Brünn 1824; studied at the gymnasium and Philosophische Lehranstalt there. In 1859 he became a member of the chamber of commerce (president in 1872). He took his seat in the Moravian diet in 1861; and in 1871 he was a member of the Lower House, entering the Upper House in the year following. In this year he was knighted and decorated with the Order of the Austrian Crown (3d class). He is also an officer of the French Legion of Honor. Gomperz is one of the owners of the cloth-factory of Auspitz Enkel at Brünn, and a member of the firm of Philipp Gomperz of Vienna. For many years he was president of the Jewish congregation of Brünn.